Kmart is starting very early this season. Now a part of the Sears family of stores, Kmart is already flooding the web with its pre-season holiday decorating ideas. This year the ornament collection is chock full of things that shimmer and shine. Bits of silver and black, and even a little bit of gold make up the most substantial percentage of the ornament collection. Large finials are a relatively new item for the mass merchant. These finials come in at a price that’s much higher than what we usually expect at Kmart. It looks like Kmart is going after the upscale buyer who wants to save money over the usual Christmas boutique stores and still get an impressive, eye-popping ornament. These finials are offered in a variety of sizes from 23″ to 42″ and unlike many specialty store ornaments are shatter-proof. They may be shatter-proof, but they’re certainly not cheap. Look for these finials to be priced from $39-$99. Those with plenty to spend may opt to cover a large tree with them. For the rest of us, we’ll opt for just one to hang from the ceiling or to place in a coveted position on an ornament stand. Yet another option is to give one as a gift that your loved one can display for years to come. 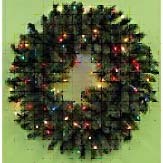 100 clear Christmas lights bedazzle this 30″ snow pine wreath from CMI. It’s also part of the Christmas Lane line now available at your local Kmart store. This retailer can also help you out with pre-lit artificial Christmas trees or just plain light-em-yourself trees. 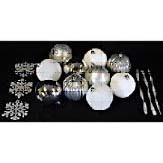 Also in stock are garlands, tree storage bags and a variety of fiber optic holiday trees in traditional green or shimmering white. Whatever your decorating plans for this holiday season, you may want to check out Kmart’s early holiday shopper bargains.